A new beginning in a league that is no stranger to such things. That’s what awaited Cabinteely FC when they took to the pitch just over a fortnight ago for their first ever League of Ireland match. A match, incidentally, that they would go on to win, beating Wexford Youths 1-0, and therefore writing the names of the squad’s 16 players into League of Ireland history. 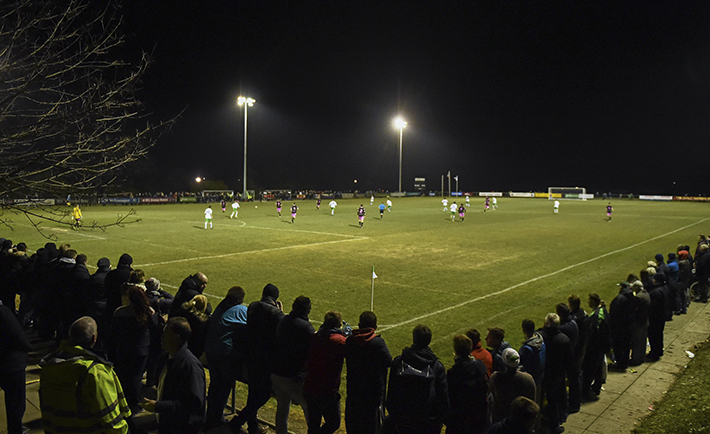 Since the FAI assumed control of the League of Ireland in 2007 seven clubs have dropped out of the league, while Salthill Devon and Mervue United merged with Galway last season to form Galway United. Despite the fact that it is the country’s national league and the highest standard at which you can play football on this island, it is not an attractive prospect for junior clubs to make the leap into. There was much grumbling to be heard from all corners of the league’s fans and hierarchy when Cabinteely were granted a licence to compete — given the fact that they are now the sixth Dublin team out of the 20 that make up the Premier and First Divisions. But the decision taken by the South Dublin club is a brave one and one that they should be applauded for. A poster advertising the match in a local pub. On making the trip to Stradbrook last Friday to see Shelbourne take on the new kids on the block, no one in the 300 to 400-strong band of Shels supporters quite knew what to expect. What materialised was a friendly, welcoming ground, albeit with no seats and simply a railing around the sides of the pitch. A bar and a small chip van brightened the surroundings up somewhat but we might as well have been standing at any of the hundreds of Sunday league games that take place around the country each week. Instead we were watching the second most successful club in the history of Irish football, one that has reached heights on a European scale never seen before by any team from this country. I’m sure you can appreciate the surrealism of the situation. Not for a second am I taking anything away from the club officials or the army of volunteers that have done Trojan work to get Cabinteely to the level they’re at and, as the largest junior football club in the country with 55 teams and 950 players, probably deserve to be. What cannot be ignored however is the glaringly amateur nature of our domestic league. How can the outstanding talent, that this country undoubtedly produces, be nurtured when a team in the second highest division in the country play their home matches on a rugby pitch that is completely unsuitable for football and, quite frankly, dangerous? 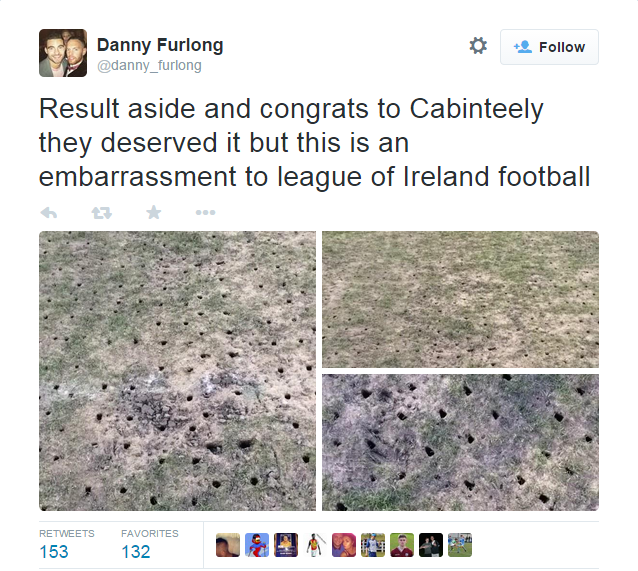 Wexford Youths’ Danny Furlong tweeted about the pitch after the first game of the season. Throughout the match fans could be heard remarking that it is only a matter of time before a player breaks an ankle over the many humps and hollows that adorn the Stradbrook playing surface. Shels came away with a deserved 1-0 victory thanks to a penalty that was dispatched by Hughes and, although Cabinteely showed a lot of spirit and fought hard, it was the pitch that prevented a wider gap in the scoreline. The old adage that the pitch is the same for both sides is undoubtedly true and the pitch itself should never be the main talking point in any football match but, when it gets to a stage where it is unsafe for players to play on it, you have to question how the FAI granted a licence for football to be played in Stradbrook. Just last season a match between Bohemians and Shamrock Rovers was postponed minutes before kick-off because of a relatively minor pitch defect beside the penalty spot. Months later the league’s governing body feels that it is okay for football to be played on a pitch that has just gone through a hard winter and numerous rugby matches. It is this FAI inconsistency that causes so much grief among fans of the league. To reiterate, Cabinteely Football Club should be commended for the work done in making the step up to the League of Ireland and, indeed, for having the bravery to do so. However, it is unfortunate that they must play in Stradbrook as it not only restricts away teams from playing decent football but it also limits Cabinteely themselves in what they can do — something that is no good for any player. As a parting word, and to put the whole thing into context somewhat; in ten days time Shamrock Rovers go to Stradbrook to take on Cabinteely in the EA Sports Cup. That being the Shamrock Rovers containing Keith Fahey, a player with 58 Premier League appearances to his name, and Stephen McPhail, the man who led Cardiff City out for the FA Cup Final at Wembley just seven years ago. Can they do it on a cold Tuesday night in Stoke? Yes. And they have. 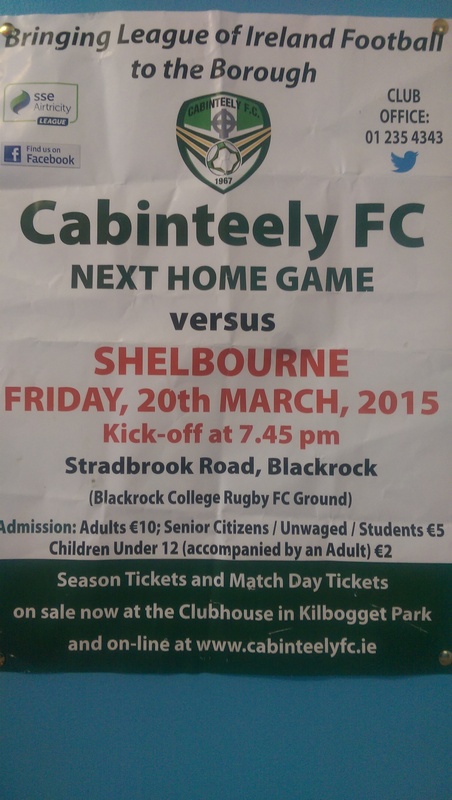 The only question that now remains is: can they do it on a cold Friday night in Stradbrook?